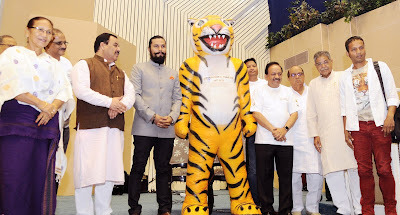 New Delhi: Union Minister of Environment, Forest and Climate Change, Dr. Harsh Vardhan said that Tiger-bearing forests play a mitigative role in combating Climate Change, besides the value of ecosystem services, provided by Tiger reserves. Addressing the Global Tiger Day celebrations at Vigyan Bhawan on Saturday, the Minister emphasized that the Tiger is a symbol of healthy environment and there can be no let-up in conservation efforts, as threats to Tigers remain ever persistent. Actor Randeep Hooda, a Tiger enthusiast, termed the Tiger as the symbol of Indian heritage. He urged people to themselves become the agents of change in this regard. The Global Tiger Day was celebrated with much fanfare. The celebrations also included two “Nukkad Natak” (street plays) by enthusiastic children on Tiger conservation. Besides the street plays, two songs on Tiger conservation were performed by Sujay Banerjee, an Indian Forest Service officer of Uttar Pradesh cadre and well-known singer, Abhishek Ray. More than 1, 000 school children cheered the presentation of the street plays and the songs. Forest Minister Assam, Ms. Pramila Rani Brahma, Minister of Forest and Environment of Odisha, Bijayshree Routray, Forest Minister of Chhatisgarh, Mahesh Gagda, Forest Minister of Uttarakhand, Harak Singh Rawat and Forest Minister of Madhya Pradesh, Gauri Shankar Shejwar, as well as senior officers from the Ministry of Environment, Forest and Climate Change and National Tiger Conservation Authority (NTCA), Global Tiger Forum, WWF attended the celebrations and also addressed the gathering.